When the season begins for amarene – sour cherries – there are buckets to be had, and I usually make sour cherry jam, which entails a lot of sweating over a hot stove. And usually the only thing baking at my house in Sicily in the summer is me, but on an unseasonally cool June day, I decided to turn the oven on and experiment with making a sour cherry cake. 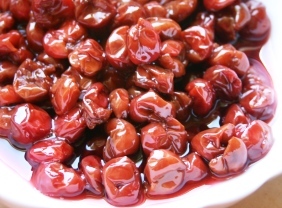 I have used a similar recipe using sweet cherries or apricots, but what to do about the very sourness of sour cherries? I solved this by giving them a sweet syrup “bath” which took the edge off the sour taste, making the cherries just pleasantly tart. This is a plain rustic cake that is not too sweet or rich, enhanced by tart little bursts of cherries and the crunch of almonds, and the sweet dusting of confectioner’s sugar was just right – a very nice combination I told myself, as I helped myself to a second slice. Since the almonds play an important role in this cake, make sure they are top quality- not rancid or strange tasting. I ate a handful just to make sure. Though expensive, I adore the pizzuta almonds from the San Basilio farm in eastern Sicily. Intensely flavored with a slightly bitter finish, they pair well with cherries. If you have not already pitted the sour cherries, then either wear a white shirt that you want to cover with indelible red spatters, or change into red. Once pitted, weigh the amarene cherries (5 oz or 150 grams,) or measure ¾ cup and set aside. Put the cherry juice in a small saucepan, stir in the ¼ cup (50 grams) of sugar, and put over low flame. Bring to a boil and simmer until reduced and thickened, then pour into a bowl and leave to cool. Butter an 8 or 9 “ (20-21cm) cake pan, then dust with flour and set aside. In a large mixing bowl, beat the butter until soft and fluffy, beat in the sugar until smooth. Mix in the almonds and vanilla, then the eggs, one at a time, beating after each addition. Add the flour with the baking powder and salt, and beat until combined. Put the batter into the pan and smooth it with a rubber spatula so that it is even. Mix the cherries with the cooled reduced juice. Place the cherries on the cake batter in concentric circles, pushing down gently on them occasionally so that a few are submerged, then fill in the spaces until you have used up the cherries. Bake at 350° F (175°C) for 30 minutes, until cake tester comes out clean and cake is nicely browned. Remove from oven, place on a rack, and sieve confectioner’s sugar over the surface. WOW, the name caught my eye, and definitely the photo. This looks wonderful! @Kim Thanks- its tastes wonderful, too! This looks/sounds amazing. Bruce and I are in Montana right now and there are going to be cherries here within the next months. This will definitely be a recipe that I make this summer (along with one we love called Cherry Ice.) See you soon!!! This turned out great! Thanks for the recipe.